We have seen numerous people who confuse their damaged display cable with a damaged screen and replace the whole of it, without realising the amount of money they are going to waste for a void cause. So, when your screen isn’t working properly then instead of getting hurry in drawing conclusions try visiting our Laptop Repair World to solve all your queries and misconceptions. 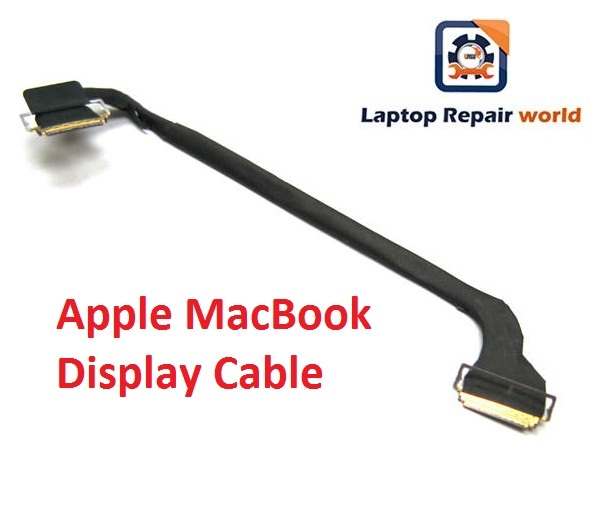 LCD / LED Screen Cable available for MacBook Air and MacBook Pro. Generally, a damaged display cable leads to the display of images in a quite disruptive manner and there would be a sheer impossibility in using your MacBook for any minor use. Also, it is completely understandable if you cannot figure the exact reason behind the abnormal behavior of your display on the screen. All the professionals we employed will advise you to bring your product to perform some good scrutiny and understand where the key problem lies without any confusion. This would help in taking decisions smoothly without any errors. The prices are relatively cheaper compared to the market and also the charges for repairing or replacement of the gadget and its components are worthy and you would never regret spending every penny on them. Arguably in market, other stores take a whole lot time in understanding and repairing your display cable as they spend days in figuring out the exact condition of your MacBook. Since all our workers are experts and experienced you don’t have to waste your precious time in repairing the device. There are good amount of discounts and other mind boggling offers exclusively available for the customers who visit us back for other problems or for further purchase of gadgets. Try reading other articles where we have discussed about numerous problems generally faced by MacBook users and do contact us for any solving any kind of questions.